Chocolate Valentine & Screenshot Campaigns! 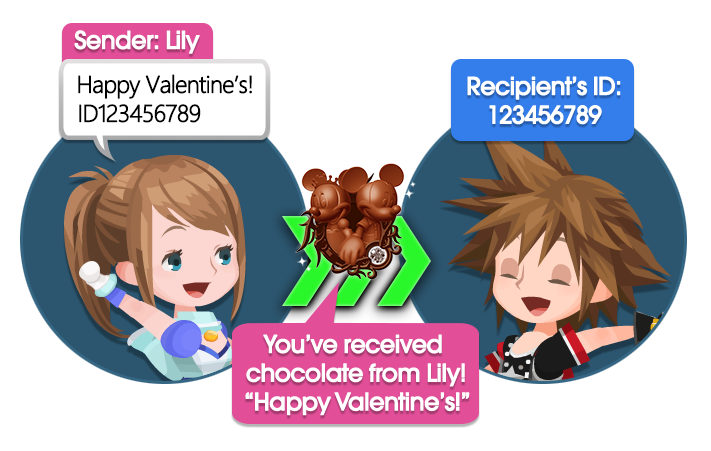 ★ Send chocolates to fellow Keyblade wielders in the Chocolate Valentine Campaign! We're also holding a screenshot contest on Twitter! We have two Valentine's Day-themed events during the above campaign period! 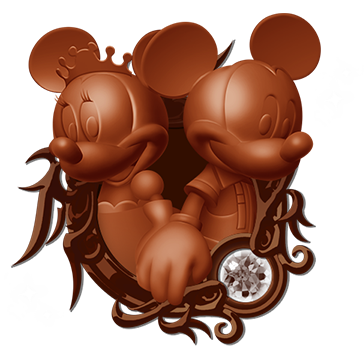 * Chocolate Valentine Medals have the same properties as Magic Mirror Medals. ★ Send and Receive Chocolate Valentines! ・During the campaign period, you can send a Chocolate Valentine to another player by setting the following as your player message! 1) The message you would like to send your recipient! 2) The Player ID of your recipient: Use half-width characters to enter the recipient's Player ID in the following format "ID-----". ・Chocolate Valentine deliveries will be finalized from Feb. 18, 2019 12:00 a.m. to 2:00 a.m. (PT) / Feb. 18, 2019 20:00 to 22:00 (GMT). Please do not change your player message during this time. The Chocolate Valentines will be delivered after Feb. 19, 2019. ・The Top 5 players who received the most Chocolate Valentines will receive a special title! 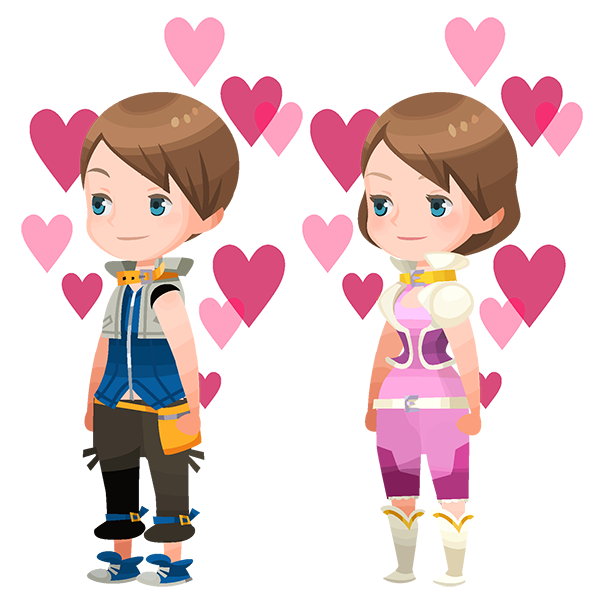 ・Additionally, if all players manage to cumulatively send at least 10,000 Chocolate Valentines to other Keyblade wielders during our special Valentine's Campaign, EVERYONE will receive one Platinum Ticket and ten 6★ Chip Medals! * If the goal of 10,000 Chocolate Valentines is met, the rewards will be distributed on or after Feb. 19, 2019. * Only player accounts registered before Feb. 1, 2019 12:00 a.m. (PT) / Feb. 1, 2019 20:00 (GMT) will be eligible to send or receive Chocolate Valentines. * Your Chocolate Valentine will NOT be delivered if your player message does not list the recipient's Player ID, the recipient Player ID contains full-width characters, or if there are any spaces or characters between "ID" and the numbers. Please be careful when entering your player message. * Your Chocolate Valentine will NOT be delivered if your player message contains multiple Player IDs or your own Player ID. 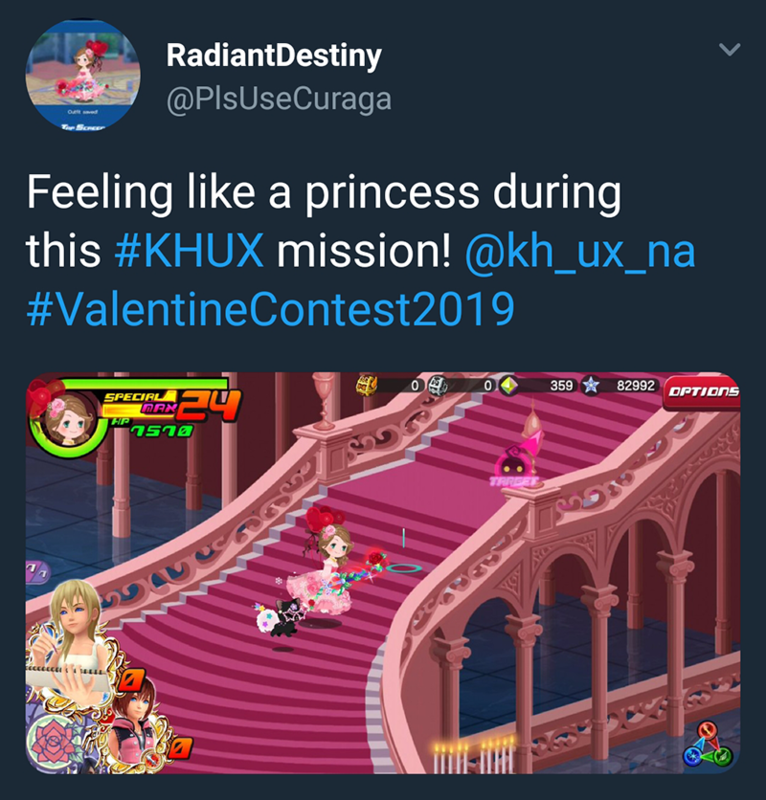 ★ KHUX Twitter Valentine's Day Screenshot Contest! The most romantic holiday is right around the corner, and we want to see your cutest costumes! Use avatar parts to create the perfect example of Valentine's Day spirit! Take a screenshot of your character in the world of KINGDOM HEARTS Union χ[Cross] and show us how you celebrate Valentine’s Day! At the end of the contest entry period, 10 winners will be selected to each receive 5000 Jewels! 1. Follow the official KHUX Twitter account! 2. Take a screenshot of your character in action, wearing a Valentine's Day-themed outfit! ・Only solo play screenshots will be accepted! ・The screenshot must feature your character in the world of KINGDOM HEARTS Union χ[Cross]! ・Entrants must possess a Twitter account following the official KHUX Twitter account. ・Entries must follow the instructions listed in the "How to Enter" section above. Entry tweets must not be a duplicate update or otherwise violate Twitter rules for posting. ・Multiple separate entries throughout the contest period are acceptable (though not more than one per day). However, if multiple winning entries are submitted by the same entrant, the entrant will only be awarded one prize total. ・Only one entry per Twitter account is allowed per day, and entrants may not submit entries through more than one account. Entrants submitting entries through multiple accounts will be ineligible. ・Multiple entrants may not submit the same screenshot. Only the first entrant who submits a particular screenshot will be considered as an entry. - Infringes upon copyright/intellectual property, personal credit, privacy, etc. The KINGDOM HEARTS Union χ[Cross] team will select winning entries based on overall creativity, originality, and Valentine's Day spirit of the screenshot containing your character! Winners will be awarded an in-game prize after the winning entries have been selected and confirmed! We will contact winners on or before February 19th via DM on Twitter! If we are unable to get in contact with a selected winner by 48 hours of initial contact, we will automatically select another winner, so make sure you’re following the official KHUX Twitter account! Kingdom Hearts Union X [Cross] Social Media Screenshot February 2019 Contest. Open to legal residents of the 50 United States, D.C., Puerto Rico, Canada (excluding Quebec), the United Kingdom (excluding British Overseas Territories), Germany, and France (excluding Overseas France) who are 18 or older. Enter between Feb. 11, 2019 12:00 a.m. to Feb. 17, 2019 11:59 p.m. (PT) / Feb. 11, 2019 8:00 to Feb. 17, 2019 7:59 (UTC). Sponsor: Square Enix, Inc., 999 N. Pacific Coast Highway #3, El Segundo, CA 90245, USA. For full terms and conditions, please see the official rules. Für die vollständigen Geschäftsbedingungen lesen Sie bitte die Offiziellen Regeln. Pour connaître l’intégralité des conditions générales, veuillez consulter le règlement officiel. Chocolate Cap, VIP Medal Quests & More! * Access to VIP Draws is only available during specific Deal periods. * Offer expires on Feb. 17, 2019 11:59 p.m. (PT) / Feb. 18, 2019 7:59 (UTC). ● VIP Chocolate Cap and 1400 Jewels Quest! Complete this quest to obtain Chocolate Cap avatar parts and 1400 Jewels! ● VIP 7★ Sora & Peter Pan and Trait Medal #83 Quest! 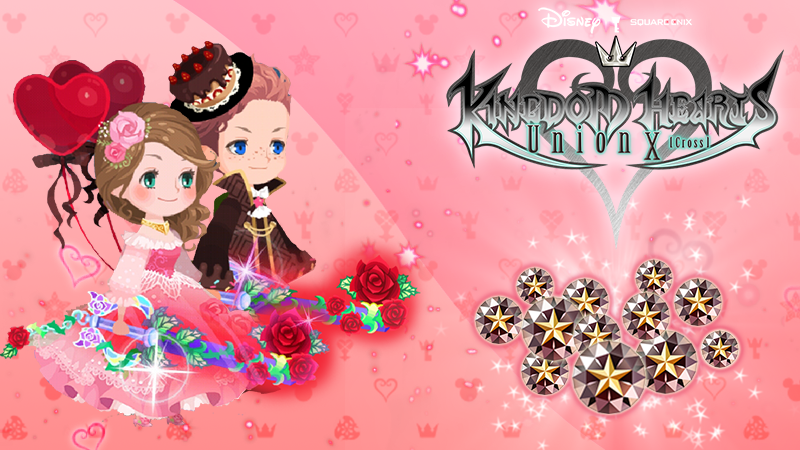 Complete this quest to obtain one 7★ Sora & Peter Pan Medal and five Trait Medal #83 medals! 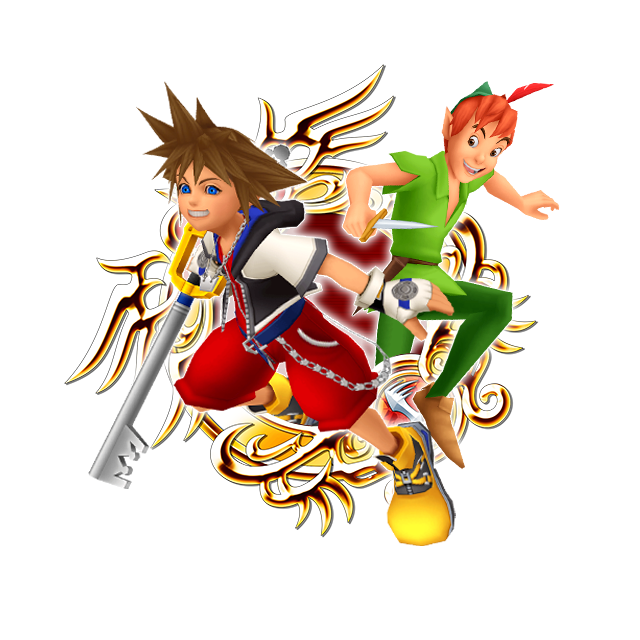 You can also get Sora & Peter Pan from the current Medal Boards! [Target: Single] 3 attacks: 15 STR, U- & P-STR, SP ATK B +200%. ● VIP 7★ KH III Sora [EX] and 7★ KH III Riku [EX+] Quest! 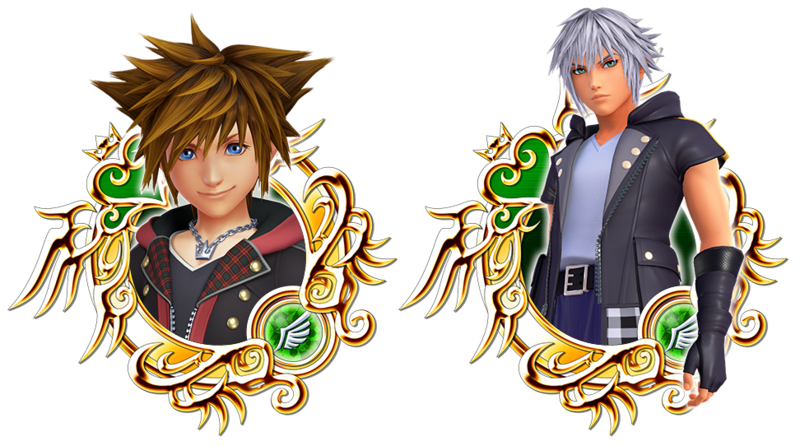 Complete this quest to obtain one 7★ KH III Sora [EX] Medal and one 7★ KH III Riku [EX+] Medal! ● SPECIAL VIP Gem Quest! Complete this SPECIAL quest to earn up to 10 Power Gems, 10 Speed Gems, and 10 Magic Gems, for a total of 30 Gems! ● SPECIAL VIP Fantasia Mickey B Quest! 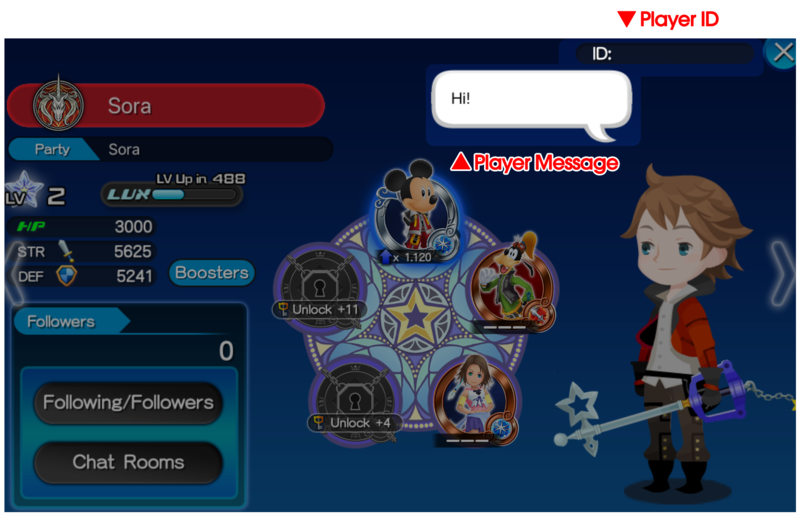 Complete this SPECIAL quest to earn up to a total of 6 Fantasia Mickey B Medals! Complete these quests to earn 6★ Chip and 6★ Dale Medals every day! NOTE: These quests and their rewards are reset every day, so don't miss out on daily rewards! Earn large amounts of Evolve, EXP, and Munny Medals and level up your skills quickly with this extremely useful quest! VIP: Daily Skills to Thrill Deal! ★ Purchase the Weekly Jewels Extravaganza to unlock this Deal! Draw once a day for FREE! You will need to purchase the ongoing Weekly Jewels Extravaganza in order to draw from this Deal. ・You may draw from this Deal ONCE per day, for FREE! ・One 5 or 6★ Scrooge Skill Medal per draw! These Medals will come with various skills, both old and new! * Individual probabilities displayed for each Skill are percentages rounded down to the nearest hundred thousandths place. As such, it is possible that the sum of all probabilities may not equal 100%. Actual probabilities for each Skill are neither rounded up nor down. * Draws are based on probabilities. Specific Skills are not guaranteed from a fixed number of draws. However, some draws have stoppers. If a stopper’s conditions are met, you are guaranteed the Skill associated with that stopper. You may get more than one of the same Skill from draws. Supernova - HD Aqua Falling Price Deal! ★ Supernova - HD Aqua returns in this Falling Price Deal! ・One Trait Medal #71 per draw! ・A 7★ Tier 7 Medal OR 7★ Tier 9 Supernova - HD Aqua per draw! ・A bonus of five Magic Mirror Medals per draw! [Target: All] Damage+: 1 enemy or 0 parts left. * This additional Gauge Cost is not affected by skills that change Gauge Cost. Example: Using a Medal with 4 Gauge Cost without a skill would be 4 + 2, for a total of 6 gauges required. 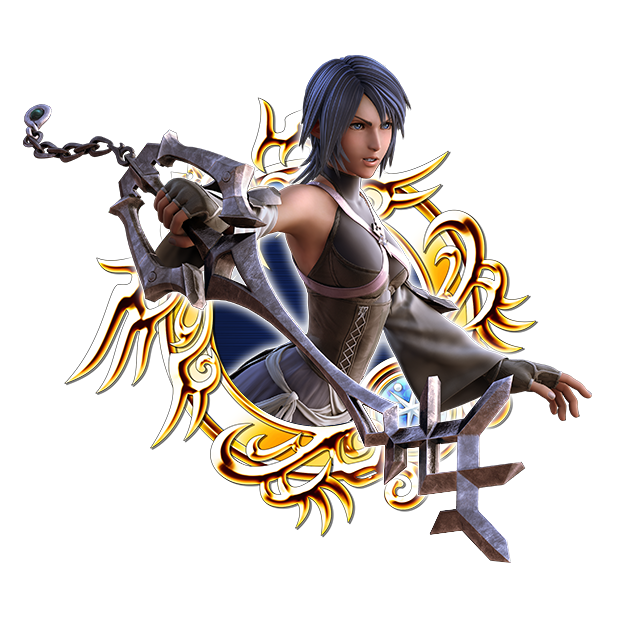 Using the same Medal with the SP Attack Gauge 0 skill would be 0 + 2, for a total of 2 gauges required. ★ Obtain Valentine Balloons avatar parts and other rewards! This time there are a total of 6 Cross Boards, 4 of which will be unlocked from the start (Magic Broom Set #2 and Magic Mirror Set #2 will unlock sequentially as follows below). Complete them to earn the new Valentine Balloons avatar parts and more! Valentine Balloons (Male) Chat Phrase: With love! Valentine Balloons (Female) Chat Phrase: For you!